OK, let’s talk about the one thing that gets the most criticism during the holidays—fruitcake! Just the mention of it makes some people crazy, and others hear it and can’t wait! And I just wonder how many recipes are out there for this trivial treat. My most favorite fruitcake of all is an Icebox Fruitcake my Grandmother Norton made every year. And believe it or not, it was a no-bake recipe! My family could eat an entire loaf in no time flat! I have her handwritten recipe, and I just love the haphazard listing of ingredients—“A batch of pecans, a jar of cherries, graham crackers,” and many other non-measured ingredients. I adore reading it! The truth is, only she knew how many pecans were in “a batch,” and she bought only one size jar of cherries. Her intuition in the kitchen was incredible­—just a quick stir and a few hours of chilling, and out came her masterpiece and beloved family favorite! Now, I am on mission to figure out the measurements and make this cherished delicacy. Isn’t it strange how those candied fruits turn up only during Christmas? According to Wikipedia, candied fruit has existed since the 14th century. Whole fruit, smaller pieces, or pieces of peel, are placed in heated sugar syrup, which absorbs the moisture from within the fruit and eventually preserves it. Depending on size and type of fruit, this process of preservation can take from several days to several months. This allows the fruit to retain its quality for a year. So, there you have it! I think this year I am going to bake a fruitcake with only the fruits I like. Because if you only put in fruits you like, then you should like the cake­! Simple logic, right? My plan is to start with a basic spice cake and add in nuts and fruits from there. This should be interesting. I really could write a book on this very subject. I did a little research and found that fruitcake varies in each country. The candied fruit, nuts, and spices are standard, but some countries soak the fruits and nuts in rum before making the cake. Apparently, the traditional methods of preserving the cake in liquors and rums will permit the cake to be edible for years. Years! That led to a little more research only to find that a 106-year-old fruitcake discovered in 2017 by the Antarctic Heritage Trust was described as in “excellent condition” and “almost” edible. Well, I’m not looking for “almost edible,” and I don’t need this cake to keep for years to come. I simply want a delicious recipe to enjoy during the holidays! So, back to the question at hand: Do you have a scrumptious recipe for fruitcake? 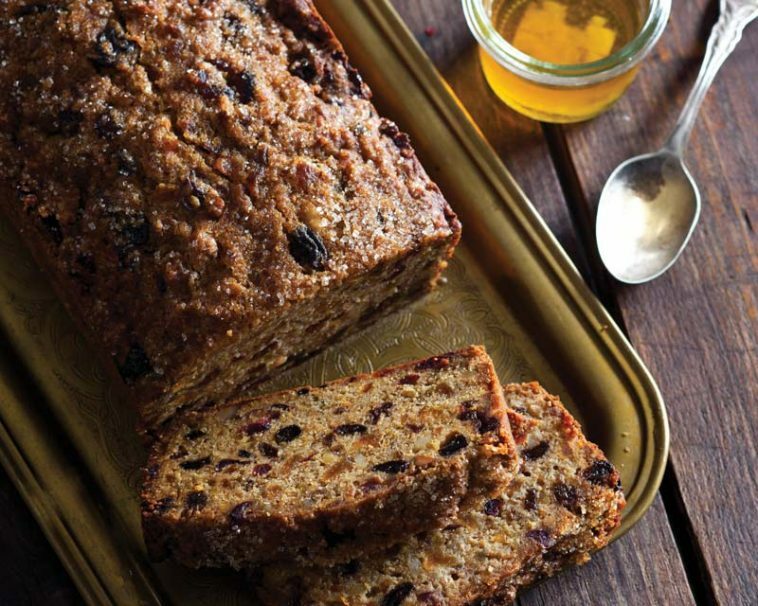 Not sold on fruitcake but still want a scrumptious treat to serve your family this Christmas? 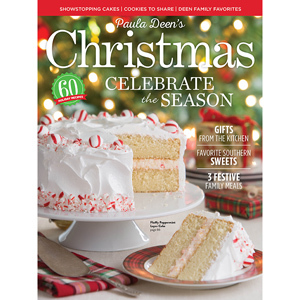 Check out this festive issue of Cooking with Paula Deen. Shop by clicking below! Heartwarming! I cherish Truman Capote’s book, and also A Child’s Christmas In Wales by Dylan. I also love mincemeat pie and Costco’s fruit cake. Thanks for your lovely words. Southern Supreme is my favorite. Count me in as a fruitcake lover. My mother who is 92 now, used to make fruitcake every year – usually one round bundt cake and several loafs and it would all get eaten, but then I think fruitcake is a tradition from the past. I don’t know many younger people who like it. She would use the turkey roaster pan to mix all the ingredients as she didn’t have a bowl large enough, and my job would be to add the splash of brandy or rum. She would make it a week or two ahead but it was wrapped in foil and never opened until just before Christmas. It was served on a tiered gold glass tray along with some cookies and passed around with the coffee after the big turkey dinner…..when really no one has room for desert other than a nibble anyway. My dad would often enjoy a slice with a small glass of port (strong brandy) while watching midnight mass on Christmas Eve. I realize now that this was probably his Irish ancestors tradition. My mother now makes it every 2 or 3 years, (with my help), and freezes the rest, but it’s hard to get a recipe out of her as like many experienced cooks she doesn’t measure anything….yes that batter looks thick enough……so every year it is slightly different! Does anyone remember having jello with fruit and whipped cream after Christmas dinner – another old desert tradition? This year I am thinking maybe sticky toffee pudding or a Bacardi rum cake…. I do like fruitcake but prefer homemade ones. The best version I have ever tried, and still make every year for my mom, is the Old-Fashioned Fruitcake on page 162 of the 1961 Betty Crocker Cookbook. My variation is that I soak the raisins, (or sometimes currants), in rum for a day before making it. Also, I add dried cranberries and cherries as well as walnuts. I make it at least 6 to 8 weeks before Christmas and brush the cake with a good quality rum each week so it slowly seeps in and keeps it moist throughout. My husband hated fruitcake until he had this one. Now he asks me to make an extra just for us! I never liked fruitcake until one day the parents of a student I was tutoring invited me for dinner just before Christmas. They served a plum pudding for dessert and it was a revelation. I had it again decades later, served by some British neighbors who made it from scratch. Rich, moist and decadent, these two had nothing in common with the usual dry fruitcake. In this region of France, people slice pain d’epices for serving foie gras. With a tiny dollop of onion confit on top. I can relate to our desire to make your gramdmother’s fruitcake. I make my mother’s. I have had it every year at Christmas for 64 years. The recipe came from a friend’s mother-in-law. 1 can condensed milk and a little milk if necessary. Don’t crush crackers to fine. My son adds cherries. My mother always packed the cake back into the wax paper box liner and put it back in the box with a rubber band around the box. My children and grandchildren insist that if not done this way, it doesn’t taste like Grammies. Now box has thin foil lining, I miss the wax paper. My fav is John Folse’s Fruitcake……recipe pops up if you google it! Along with the usual candied fruit, dates, pecans, and two kinds of raisins, he adds crushed pineapple, fig preserves, brewed coffee, brandy, and whiskey! It bakes into 6 loaves of deliciousness! My father used to receive a Corsicana Bakery (Texas) fruit cake for Christmas each year from one of his patients. I loved it and decided to make fruitcake once I was adult and had my own kitchen. I used the recipe from my maternal grandmother’s 1944 copy of Woman’s Home Companion Cook Book. The Dark Fruit Cake (also called Wedding Cake) included raisins, currants, candied lemon and orange peel, candied cherries and pineapple, citron, pecans, almonds, molasses, fruit juice, brandy, and preserved strawberries. There is hardly any flour called for in this 5-pound marvel. I would steam/bake it for 2-3 hours on low heat, usually around Thanksgiving (according to the story “A Christmas Memory” by Truman Capote), then douse the finished product with rum and brandy– and a soaked cheesecloth wrapper. A long process, though definitely worth it! Nowadays, as you may intuit from the above, I settle for the fruitcake from Costco, which gets a liberal dousing of brandy as soon as I bring it home (around Thanksgiving). The butter in the cake and the alcohol do indeed keep the cake fresh for a long while! Thank you for bringing up this controversial but tantalizing tradition. Merry Christmas! It is possible to turn non-fruit cake eaters into avid fans of the tradition. What I made lots of for years was based on a white fruit cake recipe. The only fruit I used was candied cherries, candied pineapple and pecans. I invented my own spice recipe and the cakes turned out a beautiful, rich caramel color. I sprinkled them liberally with rum or bourbon, with or without a cheesecloth according to size and availability of tin boxes to store them in as they ripened. My recipe required lots of stages of hand work- pecans were sliced across to resemble ww, candied cherries sliced across were shaped like little doughnuts, slices of candied pineapple were shaped like half closed paper fans. One year I cut up twenty cups of pecans for four recipes of fruit cake. The recipe calls for just enough cake to hold the fruit and nuts together. I used vanilla and lemon flavoring with the spices and lot of butter. The cut slices were beautiful whether I used a big pan with the funnel in the middle, loaf pans or tiny loaf pans, varying the baking time to suit each. Over the decades many people who “do not eat fruitcake” loved mine after the look of slices caught their attention. Some even asked outright to have their names put in the pot for a small loaf pan of Fruit Cake a la Betsy the next Christmas time. Really the first of my fruit cakes were made just to please my husband who didn’t like the ones which seemed to contain “turnip greens and shreds of rubber boots.” He disliked citron, fruit peeling and other hard or gritty-feeling ingredients he had tasted in other fruit cakes. After he died twenty years ago my fruitcake production dwindled as stiffening hands make it too difficult to tailor make many such morsel to my specifications. I’m in an apartment now with a really unfortunate oven. The cook book I’ve had since 1951 contains the stained fruit cake recipe and a copy for doubling. Recipes for everything are loosening in the loose leafed, hard binding of my “The Family Heirloom Cookbook”, a wedding gift – Frances Wideman’s Fig Newton-Orange Bites, Mother Lucile Bancroft Collins’ club meeting casseroles, Jean White’s, Baked Pearl Onions, Helen Bass’s Forgotten Cookies, Rose Grimmer’s Baked Fish in Paper, Zera Walton’s recipes for biscuits, Bleu Cheese Salad Dressing, and Poppy Seed-Honey Dressing, Erna Xan’s Norwegian Baked Potato pieces, Betty Sherrer’s Onion Soup from a newspaper, and my first recipe, one for Tomato Juice Frappe cut, from a magazine. I still can’t make Mama’s Rice Crispy Cheese Bits as well as she did but I try Clementine Paddleford’s Scones every now and then and find them as good as ever. My small kitchen if full of the memories of many lovely women, family members, friends and strangers catalogued by food preparations they enjoyed sharing. Best Wishes for a Beautiful Christmas even in a sad year for you. The hurt of loss never goes away but it does change and we learn to live around the holes left in our lives using some of the tangible things left to us as trustworthy guides. Melt the butter with the marshmallows. Chop cherries and nuts. Crush graham crackers. Add raisins, nuts and cherries. Add a little juice at a time if mixture is too stiff. Mix well with your (buttered) hands. Pack in a buttered loaf pan or roll into small balls. Roll some in coconut….pretty on a platter for Christmas! Now, if anyone has the recipe for old fashioned date nut candy, I would love that. I just remember that my mother made it in small logs and wrapped them in waxed paper until time to slice. Southern Love and Merry Christmas to you all! My fruitcake was made a month ago and sits in the fridge marinating in sherry. I love fruitcake and have never had a bad one. Some better than others I must admit. I have had this recipe about 35 years. I cut it out of a Southern Living magazine because it it was said to be he best fruitcake ever. The lady that submitted it was a Mrs. Robertson from Warrenton NC and this town was about 15 miles from where I lived at that time. For a fruitcake quick fix I sometimes buy a Claxton fruitcake. There is nothing like a good old slice and a cup of coffee. Good luck in finding Granmother Nortons recipe. Claxton fruit cake made in Georgia, loaded with pecans and fruit,so good! Love it and since I now live in Ohio, I can order from the Internet. Takes me back to my childhood, so happy! Merry Christmas! What gets me though is the British tradition of fruitcakes as WEDDING CAKE of all things. I can understand a 150 years ago why they were made, it was the best choice and the ingredients were considered very elaborate and special at that time, but NOW? And most Americans don’t know the traditions with the cake. While brides and grooms here are intended to eat the horribly freezer burned, bone dry top layer of their cake on their 1st anniversary (my parents couldn’t, they were in the hospital having ME), the British don’t do that. Slices of their wedding fruitcake are served at the christening of EACH child. Can you imagine what the cake was like say by child #7 or so? Also, they would give pieces of the cake to single women who in turn placed them in special small boxes sleeping with them under their pillow that night. It was said whatever man you dreamed about would be your future husband. (most likely it was indigestion due to some of the cake). This is part of the reason for the “hooha” when Prince Harry and bride Meghan broke tradition and had an “American style” cake. That’s what they call the fluffy cakes we eat, American style cakes. The standard cake in the UK is the sponge cake. In fact, most of the time they don’t even use the word cake with it. They just say, “mum made a sponge for Susie’s birthday tomorrow”. And everyone knows what they mean. The Duke and Duchess of Cambridge DID have a fruitcake, along with the groom’s cake of the Chocolate biscuit cake. (a refrigerator cake). And yes, the fruitcake was served at the christenings. Oh, and back to the issue of the wedding couple eating that top layer one year later, as a hobby baker who does wedding cakes, just as the tradition changed for children slopping in the original cake of their 1st birthday, essentially ruining it for everyone else, henceforth, the smash cake was created, so too is the wedding tradition. Many bakers and decorators are now including in the cost of the original wedding cake the charge for a small, mostly 6-inch tier, which is intended to be an exact replica of the original cake (I can see this whole thing growing out of proportion eventually though) freshly made one year later. This is due to the fact that we bakers know, that no matter HOW well that cake is wrapped and stored, its NOT going to be very edible, certainly nothing of the quality it was originally. So….bakers are now replacing it with a nice fresh one. So as my mom loves her fruitcake and I also have several other people around me that greatly enjoy fruitcake I do make several. I always make great aunt Evelyn’s White Fruitcake and then I try one or two other ones but usually as smaller loaves or cakes in small tube or Bundt pans to give as gifts. At least in my world the fruitcake is far from dead and forgotten. I just read this week about one and it the cake was the “mature” for six weeks prior to adding the marzipan and fondant outer layer and it stated that once these were added, the cake would essentially, if stored in a cool place, last quite a LONG time and if frozen, last indefinitely. I’m not sure how I feel about that. It all depends on what you call fruitcake…. Our family’s fruitcake has only golden raisins in it plus pecans and lemon extract plus the other non fruit ingredient. We call it Lemon Nut Cake. It it simply luscious! The smell while it’s baking is tantalizing! My mother made fourteen one year and gave them as gifts to our extended family. I’ve had it forChristmas morning breakfast every year but one since I was about 10 years old. I’m now 78. Would you call that tradition? The ingredients wait now in the pantry until next week. Makes my mouth water to think about it! My Grandmother, born in another century with British roots, made a fruitcake that she called Yule Cake. Very little batter made this a very rich nut and fruit fest! Lots of candied fruits and a variety of chopped nuts along with currants and raisins! My mother who will be 90 next spring, related that she wanted to make her fruitcake one more time; I guess then I will have to take over. She bakes the cake after Thanksgiving and then begins to feed it with bourbon until Christmas. I remember as a child, only my father liked the cake, but now we all eat it fondly. It is filled with the usual “green and red” fruits and lots of nuts — the classic !! Interestingly, years ago, wedding cakes were “fruit cakes.” I think I need to research the reason for that tradition. I’ll keep you posted. Have a blessed Christmas with your family and friends and enjoy your grandmother’s fruit cake. My mother made this no bake fruit cake. I think her recipe came from Alabama Home Extension agency in Auburn. I do not have her recipes. Wander if they have archieves. My blog post for today was just about this controversial dessert. Folks either love it or not love it. But, in my post, I gave my recipe – quite different and I think will turn all those not quite sure about fruitcake into a lover of fruitcake. How I came by this recipe is a story all by itself – I will share, maybe one day. The important thing is – I have shared the recipe. Go to ~ whereinspirationblooms.com for the recipe. Its the Christmas season everyone should have a piece of Fruit Cake! home decorations and sit by the tree.